Find a used Kawasaki ATV for sale and get ready to go play in the mud! Our free classifieds are a great place to find a cheap used Kawasaki Brute Force, Mule, Prairie, Bayou that's reliable or a KFX450r or KFX90 with a sporty look just for fun. Regardless of how you plan to use your used four wheeler; whether you use it for herding cattle or just riding for fun, it just makes sense to buy one from an individual when you can get it cheap and save yourself some money. We all know that cheap fun means money left to have MORE FUN! 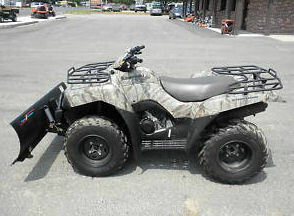 Go here to see more used Kawasaki ATVs for sale by owner. You can use the form on this page to advertise your used ATV for sale or to list any used ATV parts and accessories for sale that you have lying around at no charge...that's right our classifieds are free. I recommend to our visitors that in order to best present their ATV in Strike Lightning's GoGoCycles Used ATVs for Sale classifieds that they should upload at least one clear picture(and preferably more) of the Kawasaki ATV for sale as you can. It's also a good idea to take a moment to write a detailed description of the four wheeler including how many hours that it's been ridden (I see that question asked a lot by potential buyers!) and how money you want for it. Here at Strike Lightning Used Motorcycles for Sale Classifieds, we do our best to take care of things to make it easy to advertise your used ATVs for sale, but we can't tell you how much your stuff is worth. If you have no idea what the current blue book value of your ATV may, I suggest that you give your bank's loan officer a call and ask him to look up the loan value or tell you what the NADA motorcycle book value is. You might get a second opinion by asking somebody that you trust at the local dealership or do a search online to see what similar used Kawasaki ATVs for sale have been going for. Once you decide how much to ask for your four wheeler and write your ad, please remember after you preview the classified to check the box (after you press the submit button) that indicates that you would like to be notified when or if you get any offers or comments from interested buyers. This is a way to privately leave your email address so that buyers interested in your used Kawasaki ATV, parts or accessories for sale can reach you. In addition , consider providing a general vicinity where the four wheeler is located for the purpose of calculating shipping costs. And if you would prefer to be contacted by phone, you can leave a phone number rather than an email address.